Entropion is a disorder that causes the eyelids to roll inward toward the eye. It can affect the upper eyelid, lower eyelid or both eyelids. One or both eyes can be affected. The abnormal position of the eyelid causes the hair or eyelashes to rub against the eye itself. This is extremely uncomfortable for the dog — think of how it feels to have just one tiny eyelash rubbing against your eye. Now imagine an entire eyelid full of lashes rubbing against your eye — ouch! Even worse, with entropion in dogs, the lashes or hairs can damage the eye itself, causing scratches, scarring and even perforation. Over time, this damage can become severe, compromising your dog’s eyes and eyesight. Entropion in dogs causes the eyelid to roll inward toward the eye. Photography ©fotokate | iStock / Getty Images Plus. Entropion in dogs is usually a congenital disorder, meaning the dog is born with it. This type of entropion (called conformational entropion) has a genetic component, so it’s seen more frequently in certain breeds, including Basset Hounds, Bloodhounds, Boxers, Bulldogs, Cavalier King Charles Spaniels, Chinese Shar-Peis, Chow Chows, Cocker Spaniels, Mastiffs, Pekingese, Poodles (Toy and Miniature), Pugs, Rottweilers, Saint Bernards and Shih Tzus, just to name a few. Another common type of entropion in dogs is spastic entropion (muscle spasms cause the eyelids to rub against the eye). This type of entropion often correlates to other eye issues, which are typically painful, like a foreign body in the eye or injury or damage to the cornea. Spastic entropion is resolved using topical anesthetics to stop the spasms, followed by treatment of the underlying eye issue that’s causing the spasms. There are a few other causes of entropion in dogs, but they are much rarer. What Are the Signs of Entropion in Dogs? Recurrent corneal ulcers (scratches and cuts to the cornea of the eye). You might also see squinting or excessive blinking, eye tics or redness. Can Entropion in Dogs Be Treated? Luckily, conformational entropion in dogs can be treated. Eye drops or ointment are generally prescribed to protect the eye from rubbing and to relieve pain and discomfort. “In young dogs (less than 3 to 4 months), temporary tacking of the eyelids may relieve discomfort and secondary spastic components,” Dr. Bromberg says. Sometimes, puppies grow out of entropion as they finish growing and developing. Temporarily stitching the eyelids into a normal position alleviates the discomfort and prevents damage to the eye as you wait to see if the puppy will outgrow the condition. Outgrowing entropion is rare, though. 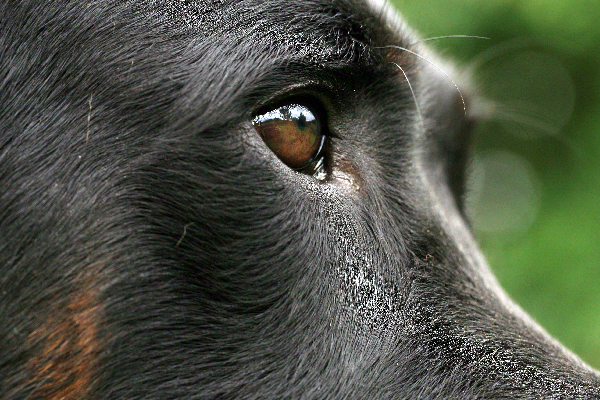 Most often, entropion in dogs requires permanent, surgical correction to reconstruct the eyelids. Your regular vet may do the procedure or you can ask for a referral to a veterinary ophthalmologist, who does such procedures regularly. What About Ectropion in Dogs? A related condition called ectropion caused the eyelids to roll outward. Although it doesn’t cause hair or lashes to rub against the eye, ectropion leaves too much of the eye exposed, leaving it vulnerable to irritation and injury from debris getting into the eye. Thumbnail: Photography ©Vulkanov | iStock / Getty Images Plus. The post Entropion in Dogs — Know the Signs and How to Treat It appeared first on Dogster.